Alarm and security solutions for the business owner. As a business owner, ensuring the protection of your business is essential. Alarm Pro Muskoka Limited is ready to help determine the security solution that is right for you. We will custom design an affordable intrusion detection system specifically for your small business, installing just what you need for a secure environment. Have peace of mind knowing Alarm Pro Muskoka Limited is safeguarding your premises with an alarm system that will alert police to all emergency alarm signals from your business's security system providing you with protection 24 hours a day, 7 days a week, 365 days a year. A protected business is a more profitable business. Let Alarm Pro Muskoka Limited help safeguard your business. Business alarm & camera solutions. 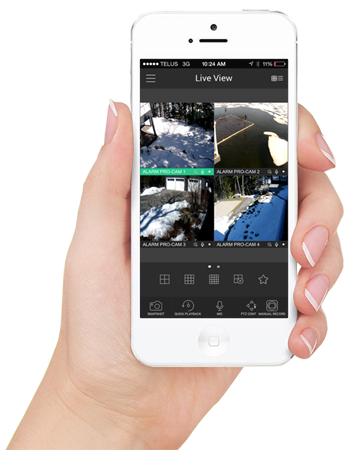 Alarm Pro Muskoka Limited has a broad range of video and camera surveillance solutions designed to safeguard your property 24/7. Ranging from single camera installations to large Megapixel Solutions, the presence of an Alarm Pro Muskoka Limited surveillance system can help you secure your assets, and reduce your top internal and external risks, resulting in improved business efficiency and enhanced operations. Video surveillance can be a fundamental part of your security system. A strong deterrent to theft and fraud, digital recording will also allow you to document events and increase your awareness and control. You will have screening access to this visual information at a time and place that is convenient for you. Let Alarm Pro Muskoka Limited design a solution customized to meet your current company needs - and plan for future ones, as well. A successful business is a secure business! Contact Alarm Pro Muskoka Limited to request a free estimate. Get a free estimate for your commercial security installation. Alarm Pro Muskoka Limited offers access control solutions to help you monitor movement on your business premises as well as control who enters and exits any area of your building or site. From any computer with Internet access, you will be able to control employee access and schedules and receive this information in real-time by e-mail or text. Easy to connect and hassle free, adding employees, doors and locations can quickly be accomplished online. Let Alarm Pro Muskoka Limited design a cost-effective solution to meet your current needs and grow as your business grows. Alarm Pro Muskoka Limited offers fire alarm systems that can be easily integrated with other alarm system solutions, and our life safety solutions are designed to help protect the lives of your employees and customers as well as your property. The Ontario Building Code (OBC), the Ontario Fire Code and the Underwriters Laboratories of Canada (ULC) dictate where, when and how fire alarms are to be installed, serviced and inspected. The Ontario Fire Code requires the inspection of life safety systems and devices at prescribed intervals. Communication systems – intercom, paging and emergency evacuation. Central monitoring – professionals that deliver peace of mind each and every day. Positioned for protection 24/7, 365 days a year.